During my eleven years of coaching, the goal I’ve heard most frequently from players I’ve coached has been to improve their forehand. From brand-new players to some of the best throwers in the world, everyone wants to add consistency, control, and distance to their forehand. An internet search yields a large number of resources intended to help throwers learn or improve their forehand. Those resources, however, often give inconsistent or incorrect messages. Sometimes, those contradictions are within a single resource: visuals that conflict with what the resource states or still shots that conflict with video. We’ve been teaching forehands long enough in our sport that there should be some obvious best practices. We have access to video that allows us to compare throwers of all levels and see what is consistent from thrower to thrower and what is different. In some cases, we can and should be able to see techniques of throwing a forehand that everyone should be doing; in others, there may be multiple acceptable techniques; and in still others, techniques may be applicable to specific throwers. It’s also critical for us to recognize the limitation of words when teaching any skill, like throwing. Visual support, including both still images and video, is incredibly valuable in reducing the time spent communicating and learning a new physical skill. This is the first article in a four part series that hopes to survey some of the forehand teaching and learning resources, identify best practices, and serve as a useful resource on its own. To start, I want to address a fundamental challenge we face when teaching the forehand: our own internal understanding of what we skilled throwers and teachers do. When we teach a skill, any skill, we often do something different than we say. At some level, this is understandable. Not all coaches are experts at executing the skills they teach. Certainly many coaches are better at teaching a skill than they are at actually doing it. Through their teaching, the best coaches can raise their players to a level even beyond what the coaches themselves can achieve. But the conflict that I want to address is more about how what we think we do and what we actually do are different. Whenever that conflict arises, we teach what we think we are doing, sometimes at the expense of the best practice that our body knows. 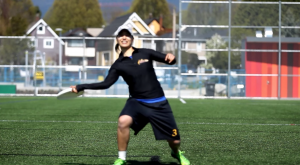 Below are two images from a resource the Vancouver Ultimate League (VUL) created for throwing a forehand. The first image, from a video found on the VUL website, captures the moment right before release. The second is a picture from the same website page that is intended to simulate the body position and disc at the moment of release. There are numerous differences between the two images including body weight distribution, angle of the forearm relative to the core, angle of the disc relative to the forearm, and off-arm position–all important components of a well-executed forehand. 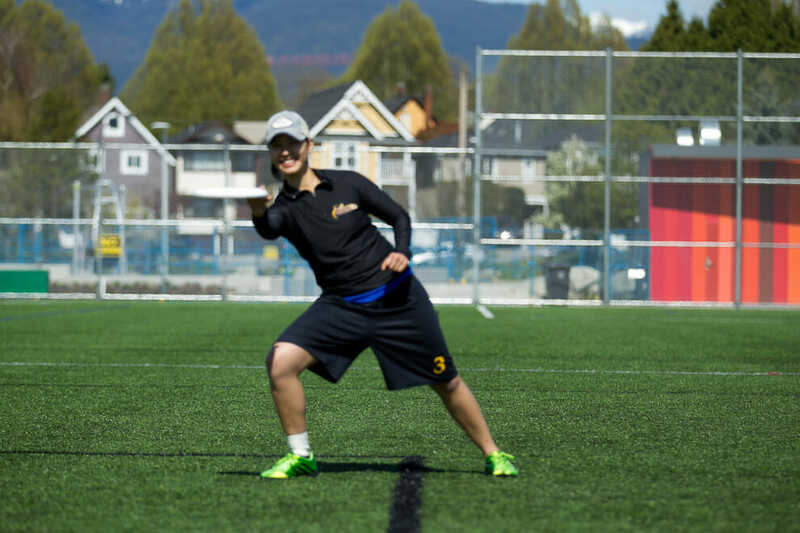 The challenge for newer players looking at the VUL website as a resource is that the video, which shows decent form, contradicts the photos on the site, yet the photos have a greater potential to leave an impression on form because they place the focus on key positions. This type of conflict between what we say and demonstrate as best practice versus how we actively execute best practice is surprisingly common. 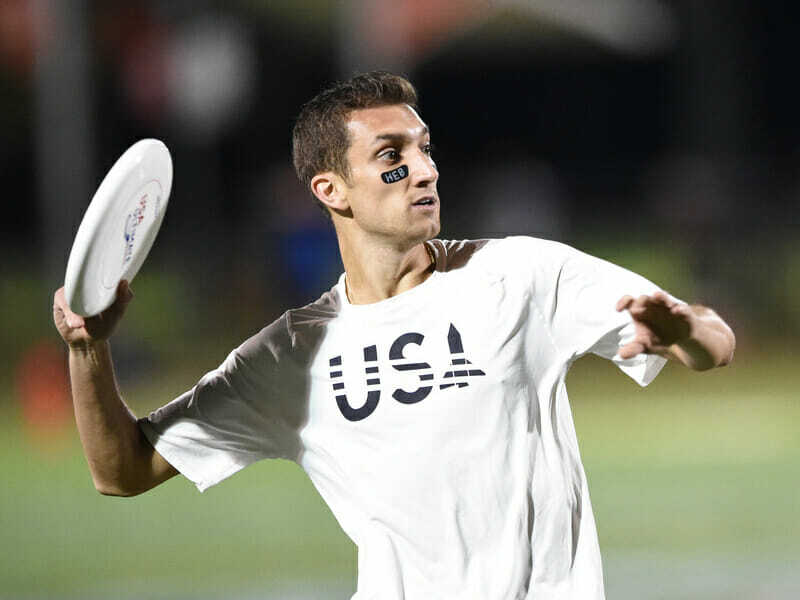 In Rise UP’s first episode of season 4, Ben Wiggins covers the forehand and discusses drawing the disc back flat as best practice. After discussing it he demonstrates the idea. However, when he throws outside of this demonstration, his draw is not flat and far different than his explicit demonstration. To get a full sense of the difference, here are stills from approximately the same point in the draw on two different throws. Again, players attempting to learn from this video are left with a confusing message. The visual execution of the skill changes while the words reinforce something opposite of what the coach is doing in his unconscious (and expert) execution of the forehand. Brodie Smith’s forehand tutorial provides another example of words not matching the execution. While, by and large, this is an excellent tutorial, one of the cues he gives is that the throw’s release should happen at the same moment as the pivot foot contacts the ground. Somewhat strangely, there are actually no throws in the whole video showing Smith’s full throwing motion including his feet. But, there are clips that show Brodie’s feet on his video about how to throw a long forehand. This gif clearly shows Brodie’s pivot foot contacting the ground prior to him releasing the disc. Below are two stills from the video. If Brodie were releasing the disc as his foot struck the ground, he’d be releasing in the first still. But his actual release is in the second still–a few small, yet important fractions of a second later. The intention of these critiques is not to nitpick or discredit these instructors or the resources themselves. All of the resources include valuable pieces of guidance. And it’s easy and a bit unfair to look at a resource that contains several tips and pick the one where the instruction is unclear or in conflict with itself. But there are two very important takeaways. 1. What we think our body is doing when we are executing a skill successfully is not always what we are actually doing. It can, therefore, be helpful to critically evaluate our theories about our own success using visual aids before passing them on. 2. Words, posed still images, or exaggerated instruction can be misleading about what the body should actually be doing. All of this is to say that visual teaching by just demonstrating the skill naturally can be incredibly valuable. There’s a reason why forehand throwers from specific programs often have similar styles of throwing. Just throwing with a skilled thrower will allow you to internalize how the mechanics can or should work. 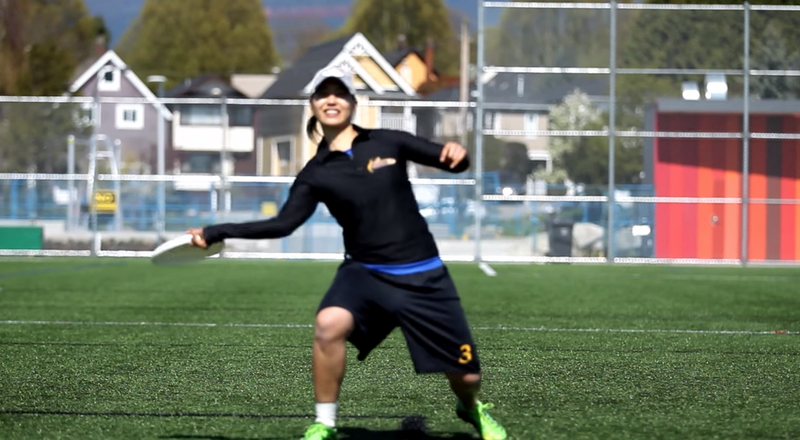 Video of top throwers throwing their forehands is also far more accessible than it used to be. This is a boon to the many developing players out there who aren’t surrounded by top level throwers who can easily demonstrate the mechanics necessary to get 50, 60, or more yards on a forehand. Comments on "The Forehand: Part I"